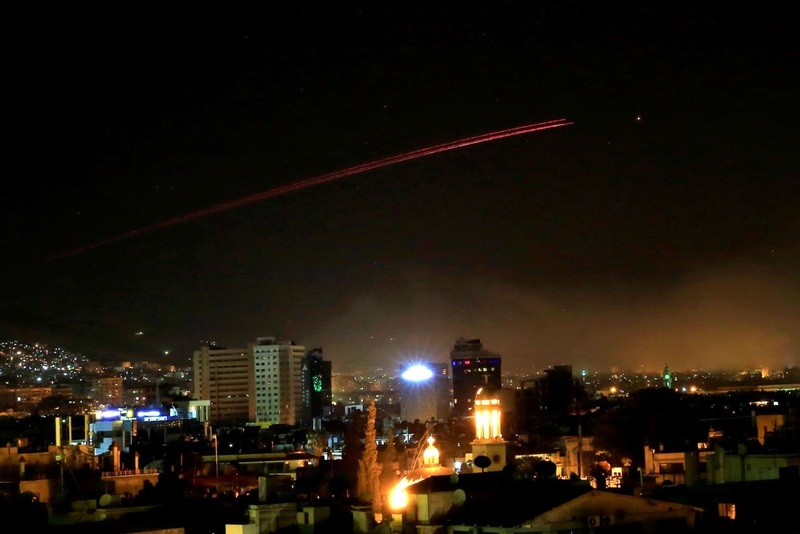 Damascus skies erupt with anti-aircraft fire as the U.S. launches an attack on Syria targeting different parts of the Syrian capital Damascus, Syria, early on April 14. Syria's capital has been rocked by loud explosions that lit up the sky with heavy smoke as U.S. President Donald Trump announced airstrikes in retaliation for the country's alleged use of chemical weapons. U.S., British and French forces struck #Syria with more than 100 missiles on Saturday in the first coordinated Western strikes against the Damascus government, targetting what they called chemical weapons sites in retaliation for a poison gas attack. U.S. President Donald Trump announced the military action from the White House, saying the three allies had "marshaled their righteous power against barbarism and brutality." The bombing represents a major escalation putting the West in direct confrontation with Assad's superpower ally Russia, but is unlikely to alter the course of a multi-sided war which has killed at least half a million people in the past seven years. By morning, the Western countries said their bombing was over for now. Syria released video of President Bashar al-Assad, whose Russian- and Iranian-backed forces have already driven his enemies from Syria's major towns and cities, arriving at work as usual, with the caption "morning of resilience." British Prime Minister Theresa May described the strike as "limited and targeted." She said she had authorized the British action after intelligence indicated Assad's government was responsible for the attack using chemical weapons in the Damascus suburb of Douma a week ago. With more than 100 missiles fired from ships and manned aircraft, the allies struck three of Syria's main chemical weapons facilities, U.S. Defense Secretary Jim Mattis and Joint Chiefs of Staff Chairman General Joseph Dunford said. Mattis called the strikes a "one time shot," although Trump raised the prospect of further strikes if Assad's government again used chemical weapons. "We are prepared to sustain this response until the Syrian regime stops its use of prohibited chemical agents," the U.S. president said in a televised address. The United States, Britain and France have all bombed the Islamic State group in Syria for years and had troops on the ground to fight them, but refrained from targetting Assad's government apart from a volley of U.S. missiles last year. Assad's government and allies responded outwardly with fury, although there were also clear suggestions that they considered the attack a one-off, unlikely to harm Assad. "If it is finished, and there is no second round, it will be considered limited," the official said. Russia's ambassador to the United States, Anatoly Antonov, said on Twitter: "Again, we are being threatened. We warned that such actions will not be left without consequences." Syrian state media called the attack a "flagrant violation of international law." An official in Iran's Revolutionary Guards said it would cause consequences that were against U.S. interests. French Defence Minister Florence Parly said the Russians "were warned beforehand" to avoid inadvertant escalation. Iran's Foreign Ministry condemned the U.S.-led attacks and said Washington and its allies would bear responsibility for the consequences in the region and beyond, state media reported. Allegations of Assad's chlorine use are frequent in Syria's conflict, raising questions about whether Washington had lowered the threshold for military action in Syria by deciding to strike after a chlorine attack. Syria agreed in 2013 to give up its chemical weapons. It is still permitted to have chlorine for civilian use, although its use as a weapon is banned. Mattis, who U.S. officials said had earlier warned in internal debates that too large an attack would risk confrontation with Russia, described the strikes as a one-off to dissuade Assad from "doing this again." "America does not seek an indefinite presence in Syria, under no circumstances," Trump said in his address. "The purpose of our actions tonight is to establish a strong deterrent against the production, spread and use of chemical weapons."